Shelia E. Lipsey is a multi-award winning author. Her novels are available at most bookstores nationwide as well as online. Lipsey’s books have been called gripping, life-altering, memorable and realistic. 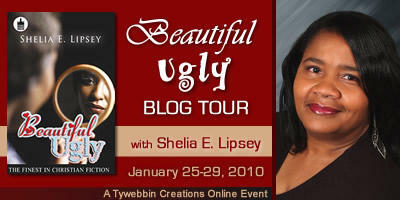 Lipsey was recently awarded the 2009 Top Shelf Award for Beautiful Ugly by Black Pearls Magazine. She also won 2009 Shades of Romance Readers’ Choice Awards for My Son’s Wife in the following categories: Author of the Year, Christian fiction Book of the Year, Christian Romance of the Year, Best Book Cover of the Year, Best Fiction Book of the Year, among several other awards for her novels, Into Each Life and Sinsatiable. My writing offers the following legacy to future readers…..words in print can never be taken away, even after our physical bodies have gone on eternally. As much as I am sorrowful about the recent deaths of authors such as E. Lynn Harris and the first AA Romance Novelist, Elsie B. Washington, there works will forever live on. My books are my legacy. They not only showcase my talent to the world, but they will forever linger in the lives of my children, grandchildren and on and on. I envision that perhaps one day after I have met my demise, that someone, somewhere, in the distant future will pick up a book and they will note the author is Shelia E. Lipsey. From one generation to the next, words change lives. From one generation to the next, our words speak volumes about the past, present and future. Words are powerful. They are even more powerful when they are written. That’s why the Bible and what God says inside the Bible can never be taken away or destroyed. It is written, God says, man shall not live by bread alone. Even God uses the word written. God says my tongue is the pen of a ready writer. The word of God also says “Write the vision, and make it plain on tablets, that he who runs may read it. I write not only because I have to write because it is God’s gift and purpose to me and for me, but I write because there are so many thoughts, feelings, and emotions inside of me that are eager to give birth. Everyone leaves a legacy. Everyone has a choice whether the legacy they leave for the future is one that will positively or negatively impact families, loved ones and the world. I choose to leave a legacy of the redeeming love, mercy and grace of Jesus Christ. Ella: Introduce us to your book, Beautiful Ugly. Beautiful Ugly is the story of three close friends. Each one of them has life challenges, and each of them love, encourage and support each other through the good and the bad. Sometimes we look in the mirror, like Layla does in Beautiful Ugly, and we see an ugly image of ourselves. We fail to see the beauty that God has created. Or we may be like Envy, whose life is based on her name. She struggles with who she really is and why the person she sees in the mirror is not the beautiful, intelligent, smart woman that God made her to be. Instead she sees a young woman who has deep, dark secrets that only she and God know about. As for Kacie, she equates beauty to having a man. She looks in the mirror and she sees a physically handicapped woman with a bad limp, and six children with six different baby daddies. Her vision of herself is one of low self-esteem and self-worth. How do they face the problems of life? How do they look at themselves and see that they are all wonderful creatures designed by God. When will they learn that beauty comes in so many different ways that even the human eye cannot conceive? Three friends struggle to learn their true identity that only God can define for them. Ella: Introduce us to your message and the main characters. The main characters in Beautiful Ugly are three, 30 year old women. They have been good friends for eleven years. There is Layla Hobbs, who has a singing voice that could easily give Jennifer Hudson a run for the money. She is the lead singer in her church choir, but she battles some serious issues over her size. Envy Wilson is a beautiful, intelligent successful business woman, who is also very promiscuous, something her friends do not know about her. She also has a deep, dark secret that haunts her life. Kacie Mayweather, is a part time cashier, lives on Section 8 and has six children by six different men. She has real self-esteem issues because of her physical disability of cerebral palsy. The message in Beautiful Ugly can only be determined by the person who reads the book and dares to stand before the mirror and see themselves for who they are and for how God created them, which is fearfully and wonderfully made. Ella: Are your characters from the portrayal of real people? Yes, my stories are from the portrayal of real people because that is the way I write. I write about every day people, so that somewhere, someone will pick up one of my novels and be able to identify with someone in the book, or know of someone like my characters. That is the essence of my gift of writing. I call it perfect stories about imperfect people. Ella: What inspired you to write this story? I write stories according to what God places in my spirit to write. At first, a title is given to me, and from that point, God orchestrates the words on the pages. Beautiful Ugly is such an everyday story for many women in the world today. We all have issues of some kind with our outward appearances whether we consider ourselves fine, thick or ugly and fat. Society just about bases everything on outward appearances, which is not the way it should be. Unfortunately, it is what it is; the world is warped when it comes to defining the difference in Beauty and Ugly. Ella: What issues in today’s society have you addressed in the book? Beautiful Ugly addresses issues of how the world views individuals based on outward appearances. It discusses issues of low self-esteem, self-consciousness, secrets that we hide from the closest of friends and families, and the importance of loving one’s self. Ella: Was it difficult to complete the novel? Beautiful Ugly, surprisingly was not difficult to write. Having a physical disability of my own, I was easily able to get into the lives of my characters. I faced many of the same type of problems and issues they have; not all of them, but I can say that looking around today, I saw something of my characters in everyone my path crosses. Ella: Why did you decide to pick the Christian fiction genre for your book? I did not pick Christian fiction as my genre. Christian fiction picked me. When I self published my first novel back in 2000, I called it inspirational because at that time there was no such thing as AA Christian fiction, at least not that I recall. I started out with the great fiction authors like Victoria Christopher Murray, Vanessa Griggs and Jacqueline Thomas. They have taken their writings to a much higher level and enjoyed tremendous success. Knowing and seeing how God has prospered them in their genre of writing, gives me hope to rise to their level of greatness and beyond. Ella: What is your most valuable lesson about the publishing industry? The publishing industry can afford to be very choosy about who they offer a book deal. Today, the AA market and non AA markets too, are bombarded with a flood of authors. It is an industry that I believe will forever remain, and I believe we will see an even larger influx of self published authors coming on the literary scene. Ella: What writers inspire you and why? I am a J. California Cooper fan because her writing is so pure. What I mean by pure is that she is able to weave a story that compels readers to her character(s). She is one that will go down in the great history of literature and be talked about in years to come like other great authors such as Faulkner, Washington, Walker, Morrison and so many more. Ella: What did you hope to accomplish by writing this particular story? What I hoped to accomplish is for those who reader Beautiful Ugly will close the pages of the book and be drawn toward their own inner beauty. I hope that those who do not like the person standing in the mirror, will read Beautiful Ugly and then see the wondrous, unique individual God Himself created him/her to be. Ella: Share with us your latest news, awards or upcoming book releases. Some of my latest news is that I was awarded several times over, the 2009 SORMAG Readers’ Choice Award. I was also awarded the prestigious 2009 Black Pearls Top Book Awards. Beautiful Ugly will be available nationwide August 1, 2009. Also the sequel to My Son’s Wife will be released September 2010 and the title is My Son’s ex-Wife-The Aftermath. You can contact Shelia E. Lipsey at shelialipsey@yahoo.com You can learn more about me by visiting my website http://www.shelialipsey.com/ All books are available in bookstores nationwide as well as online at sites such as Amazon.com; bn.com; target.com; Wal-mart.com; Black Expressions. Please join in the discussion by leaving comments below. President Barack Obama gave a inspiring speech for his first State of the Union Address last night about keeping the hope, and going forward that through these most challenging times in our country and the world we can and will restore our economy. Hold on to ‘hope” even though things may be difficult right now, that today does not have to be your tomorrow. And as we go forward to putting our dreams in action the economy will get better. I have a poem I hope will inspire you that is titled In Due Season. This poem is also from my book Faith, Hope & Love. May you be inspired. And please share this poem with others. I can only stay where he wants me to be. I know He will grant. In Due Season copyright (c) Doris Washington, April 2008. All rights reserved. Lawyer and author Pamela Samuels Young continues to receive accolades for her page turning legal thrillers that present the legal detail and mouthwatering suspense of John Grisham, combined with the understanding of urban love, explosive language and humor of Terry McMillan. As Pamela Samuels Young builds on the success of her previous three novels, the last being, “Murder on the Down Low,” she is now promoting her fourth novel, “Buying Time.” Ms. Young will be discussing “Buying Time” and other topics as she joins a panel at the Marina Del Rey Library on Saturday, February 20, 2010, from 1 p.m. to 3 p.m. The library is located at 4533 Admiralty Way, MDR, CA 90292, (310.821.3415). This panel is being presented by the organization Sisters in Crime Los Angeles. The theme for the panel discussion will be “Kiss Me Deadly,” in honor of Valentine’s Day. The panel will discuss the roles of love, death and murder in mystery novels. Ms. Young will be joined on the panel by fellow mystery writers Gerry Schiller and Dorothy Howell. The panel will be moderated by Eric Stone. Pamela Samuels Young’s novels (Every Reasonable Doubt, In Firm Pursuit, Murder on the Down Low and Buying Time) are available everywhere books are sold. 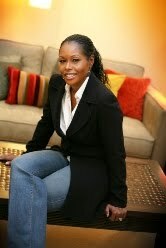 Pamela Samuels Young is a practicing attorney and the author of four legal thrillers. 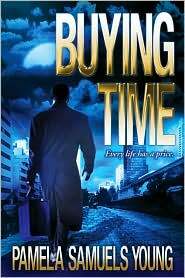 Buying Time, her most recent release, is a scandalous tale of blackmail, murder and betrayal. The book was recently honored by the Black Caucus of the American Library Association, which selected Buying Time as its 2010 Literary Award winner in the Fiction category. The lack of women and people of color depicted as hot shot attorneys in the legal thrillers she read motivated Pamela to take a stab at creating the kind of characters she wanted to see. In the process, the former journalist discovered her passion. A native of Compton, Pamela balances her writing career while working as Managing Counsel for Labor and Employment Law at Toyota Motor Sales, Inc. in Torrance. She is the Fiction Expert for BizyMoms.com and is on the Board of Directors of the Southern California Chapter of Mystery Writers of America. Pamela is a graduate of USC, Northwestern University and UC Berkeley’s Boalt Hall School of Law. American Women in Radio and Television is pleased to announce keynote speakers Dr. Robert Rosen and Vivian Schiller for the Women’s Media Forum to be held March 5-6, 2010 at the Embassy Suites Washington, DC Hotel at 900 10th Street NW, Washington, DC 20001. Dr. Robert Rosen, Author of Just Enough Anxiety: The Hidden Driver of Business Success, is an internationally recognized psychologist, best-selling author, researcher, and business advisor to world-class companies. Dr. Rosen will deliver the opening keynote address during this year’s AWRT Women’s Media Forum at 8:30 a.m. on Friday, March 5, 2010. Vivian Schiller joined National Public Radio as President and CEO on January 5, 2009. Schiller oversees all of NPR’s operations and initiatives, including the organization’s critical partnerships with 800+ member stations, and their service to the more than 26 million people who listen to NPR programming every week. She came to NPR from The New York Times Company where she served as Senior Vice President and General Manager of NYTimes.com. She will be delivering the keynote luncheon address at 12:15 p.m. also on Friday, March 5, 2010. During the luncheon, AWRT will also hold its Pass the Gavel Ceremony and present the AWRT Achievement Award to Chickie Bucco. About AWRT: The year 2010 marks the 59th Anniversary of American Women in Radio & Television (AWRT), the longest established professional association dedicated to advancing women in media and entertainment. AWRT carries forth its mission by educating, advocating and acting as a resource to its members and the industry at large. Founded in 1951, AWRT works to improve the quality of electronic media; promote the entry, development and advancement of women in the field; foster communication and idea exchange; and give back to the community we serve. About The Foundation of AWRT: The Foundation of AWRT is the philanthropic arm of American Women in Radio & Television, supporting educational programs, charitable activities, public service campaigns and scholarships to benefit the public, the electronic media and allied fields. The Foundation of AWRT has created partnerships and joint-initiatives with the National Middle School Association, the Emma Bowen Foundation, the American Red Cross and other organizations that are philosophically aligned with the mission of the Foundation of AWRT. The Foundation supports several public service campaigns, including most recently AWRT Empowering America, which pays tribute to many of America’s most pioneering and inspiring women. Through this initiative, the Foundation of AWRT has adopted needy urban middle schools around the country and provided educational donations derived from collateral based on the Empowering America program. The Foundation also produces nationally acclaimed recognition programs, including the Gracie Awards®, a live gala that awards exemplary programming created for, by and about women. Ella: Greetings Mr. Boulton, tell us a little about youself. 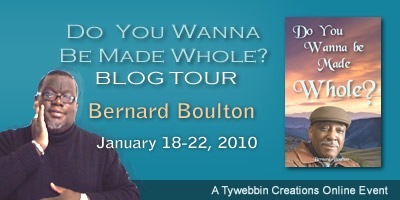 My name is Bernard Boulton and I am a man who is in pursuit of his destiny and purpose. I believe that God placed me in the earth to communicate hope through the medium of communication. For twenty five years I have communicated His word through preaching and now I have enlarged that ministry through writing. My passion for writing is ignited by my reading. I love to read and I love to read fiction. Reading fictional accounts about people who have been challenged by life always lights a spark in me to write. When I’m reading others stories those authors become voices in my spirit that pull out of me the narratives that I hear in my head. What God has set in my heart is a desire to write and the many novels that I’ve read has been the source of motivation for me. Ella: What legacy would you say your writing offers future readers? My writing offers the following legacy to future readers to say yes to your dreams and produce whatever your dreams are spraking to you so that when you leave this world you will leave something behind that will bless others. Ella: Where are you from? What is your favorite genre? How did you start your journey? I was born in Cleveland Ohio and I am living In Danville Virginia. Christian fiction is my favorite genre. I started writing stories when I was ten years old. I wrote stories that stretched my imagination. I remember after watching Willy Wonka and the Chocolate Factory that I wrote a story about a little boy who went to live in the chocolate factory. In the story I was the little boy. When I reached my teens the interest in writing waned. It was after I went to college at the Cuyahoga Community College and met Dr George Eppley that my interest in writing returned. I did a lot of creative writing in his class and the spark was ignited again. This is a story of overcoming the past to live in the future. The main character Pastor James Maxwell is a spiritual father to three men; Theo Dexter, Micheal Cain and Adam Jones. The inspiration of the story is taken from the Bible in St John chapter 5 where Jesus comes to a man and asked him did he want to be made whole. 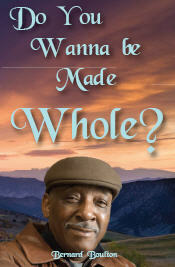 The story is dealing with three men who with the help of Pastor Maxwell goes through the process of being made whole. Throughout the story Pastor Maxwell is transparent as he gives himself as an example of a man who made mistakes in his past and is now using the wisdom from his those failures to teach men that they can overcome. Ella: What do you like about your two main characters? Pastor James Maxwell knows the pain of making poor choices that damages families. He has dedicated his life to helping men avoid the mistakes that he has made in his life. Now he walks through the valley with three of his spiritual sons as they try to find their way to wholeness. Will Pastor Maxwell be able to help Theo find forgiveness for the one who betrayed him? Can he help Michael who suffered a great tragedy in his life? Will he be able to help Adam face his past and discover a new future? The two main characters are Pastor Maxwell and Theo Dexter. I like the portrayal of Pastor Maxwell as a gentle giant. He is a man of strength who has a passion for aiding men in their spiritual walk. I like Theo’s struggles between doing what he wants to do and doing what is right. In both of these men I like their imperfections but at the end of the day they represent a manner of manhood that I beleive appeals to both men and women. Ella: How does this book add value to your reader’s life? I hope that this story will add value to people’s lives by causing them to celebrate and appreciate what the message of this novel is conveying. I hope that it empowers people who are trying to put the pieces of their lives back together after a crisis and and that it encourages people to know that what they went through yesterday does not have to be everyday in their life. Ella: Name 3 things that it takes to make a successful author, in your opinion. In my opinion a successful author is a person who first pursues their writing consistently. Secondly success is having a mentor who is willing to teach you. And third success is writing stories that connect with people in a meaningful way. In the future you can expect a sequel to DO YOU WANNA BE MADE WHOLE? and a nonfiction book that deals with a topic of interest to a great many people. Readers visit the author’s website to order the book and to read excerpts. This straight talk book about bankruptcy and the lessons learned was a God ordered process. Theresa, an entrepreneur specializing in event planning, was forced to file bankruptcy in 2006 due to her putting her trust in one client, and not putting her trust in God. She had good credit all of her life but due to the unethical practices of this client, her finances spun out of control. After many phone calls for help from so-called friends and family, the last option was to file bankruptcy to save her home. Theresa D. Royal, who holds a degree in Small Business Management from Central Pennsylvania College, dispels the myths that everyone who files for bankruptcy has bad credit or is just trying to get out of paying their debts. Bankruptcy “Ain’t” Broke will give a true account about the struggles of bankruptcy and addresses this taboo subject, especially in the African American and Latino communities. It’s a subject that is often whispered about in minority communities but is discussed openly in other ethnic groups. Bankruptcy in most cases can help those who have no way out of a really bad financial situation. She is also the owner of TD Royal Enterprises, LLC, the holding company for her book publishing, event planning, real estate investing and other business ventures she is pursuing, and is the President and CEO of Entrepreneurs and Professionals Network (EPNET), an organization that encourages individuals, especially minorities, to pursue their passion of owning their own businesses. Theresa D. Royal was faced with the difficult decision to file bankruptcy in 2006 due to an unethical client and bad business deal. During the timeframe after she initially filed bankruptcy, there were a string of events that were happening in my life and she felt like the weight of the world was on her shoulders. She was even close to committing suicide because of the stress and enormity of the situation and felt utterly and totally alone. 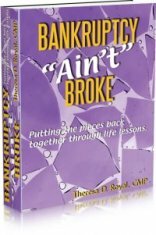 Theresa is a regular person just like you who had no clue what bankruptcy was or how it would affect her life. This book is not a rag to riches story. It is a true account of her filing bankruptcy and the struggles she has dealt with emotionally and financially over the past three years and how she is dealing with it even to this present day. She gives down to earth, positive perspective to those who are on the verge of filing, have already filed, know someone who has filed or someone having a tough financial situation. Website: http://www.bankruptcyaintbroke.com/; Bookseller: Self-Published through TD Royal Enterprises, LLC; Booksellers: Amazon.com and http://www.bankruptcyaintbroke.com/ website. I have a toddler who loves Monster Trucks. I mean truly loves Monster Trucks. At three he could name his favorite trucks, Grave Digger, Blue Thunder, Maxium Destruction. I even know that Dennis Anderson drives Grave Digger. It was crazy because I had no clue what a Monster Truck was. My father was flipping through the channels one day and on the Speed Channel was a Monster Truck Show. Well needless to say at Grandpa’s House that is what my son watches. When I would go to Walmart I would pick him up two and thought I was doing good. At $3.97 a piece I could handle a couple of trucks every now and then. Recently I sat down with Ty and asked him what he wanted for Christmas. His response was simply more Monster Trucks. He named the ones he wanted most, Taz and El Toro Loco. So in my mind I was set. If I bought him his favorite 10 Ty would be good for Christmas, of course along with my favorite pajamas from Target. My co-workers and I are pretty close. We talk about our children and of course we discussed Christmas and what are children were expecting. One day I heard God speak to me before entering my school building. He said, “Arlinda don’t take anything in the building with you. There is something you need to bring out today.” I listened and I kept my things in the car. One of my favorite prayers is the Prayer of Jabez…Oh! That You bless me indeed….Ty knew to ask in faith and expect it. He didn’t get the ten mommy was going to give he received way more. If a child can ask in faith and expect it shouldn’t we be able to do the same? I am asking in faith and expecting to be blessed indeed and for my territory to be enlarged. How about you? I am taking my faith to that next level of expectancy. Posted By Lindar to LindarInsights -read more inspirational articles and blogs.